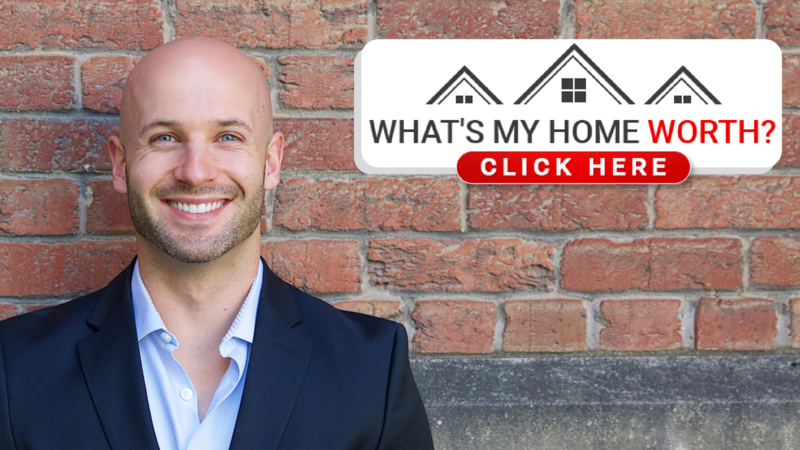 When You list Your home with me it's so much more than just putting Your home up on a website, ordering some flyers to pass around the neighbourhood and hoping that people see Your home and want to go take a look at it. I go the extra mile and create a BIG Brand Marketing Campaign with a company that I've partnered with called Real Agent Connect. Real Agent Connect specializes in helping realtors sell real estate online and has created phenomenal results for realtors over the last 10 years. That being said, few realtors use their service, and they're starting to get left behind as buyers shift from looking at homes from traditional methods (newspaper, magazines, flyers) to over 90% of them starting their home search online. So why not market Your home where people are actually looking? Below is a quick video on how Real Agent Connect creates a Big Brand Marketing Campaign for Your home, how they get Your home in front of the right buyers, and how Your home can literally be seen by thousands of people who are already looking for a home just like Yours. This is Your secret weapon in marketing Your home and is THE most important aspect in our Big Brand Marketing Campaign. Not only that, but we actually have live feedback and data from our ads so that we know how many times Your home has been seen, what the demographic is of our potential buyers, how many times they've looked at Your home online, how effective our ads are, how long they're looking at Your ad and a plethora of other data that helps us in locating the perfect buyer for Your home. Each and every home is different and therefore needs specialized marketing so that we can showcase Your home to it's strengths. The first step is taking the best pictures possible to shine a spotlight on Your home so that it stands out from the competition. I do this by taking professional HDR (high dynamic range) pictures with my DSLR camera with a wide angle lens so that we can capture as much of each room as possible. You can take a look at some of my pictures by clicking here. 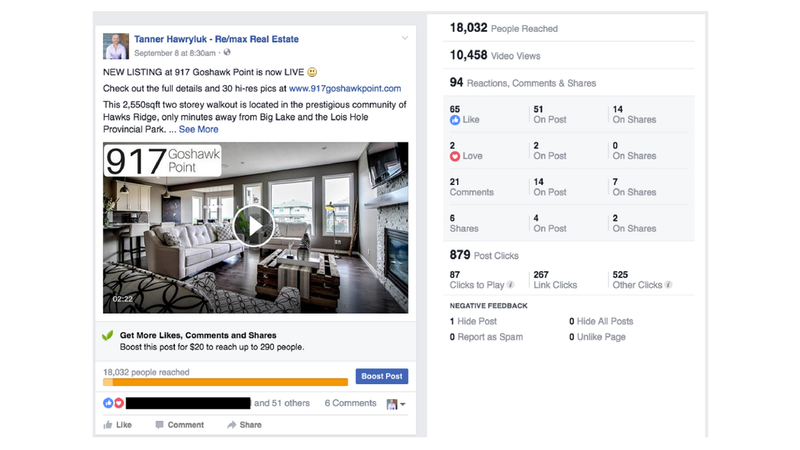 The second step is creating engaging content such as video walk throughs, short video ads to be played on Youtube that highlight a certain part of Your home, open house video invites or even highlighting the community in which Your home is located. Whats great about these videos is that people aren't used to seeing them when showcasing a home and I try to make these videos entertaining so that people will actually WANT to watch them to the end...and let's face it, we've all seen those videos where we turn it off within the first couple seconds. These videos generally create a TON of excitement and curiosity from people and are literally seen by thousands of people. Below is a snapshot of the results of a video ad I created for a client after only marketing it for a short time. ...so as You can see the video ad for this home was seen by almost 20,000 people and the video was watched over 10,000 times. It also had 91 total reactions to this ad (besides the video views) and had over 21 comments. Now whats important about this, is that the comments were from people I didn't even know. So this video opened the door and started a conversation about this home among the Facebook community. I then privately messaged each person that commented on this ad to see if I could help them with a real estate related question, or to set up a viewing on this particular home. Now that's POWERFUL! I can make these videos any style and generally try to create a video that matches the character of Your home so that people can feel good and even picture themselves living in Your home while the video is playing. With that being said, not all homes or communities video well...so this is something I take into consideration and make the call after we have Your home listed. After all, we want to highlight and make Your home stand out from Your competition. You can take a look at some of my videos by clicking here. We all know that social media is a HUGE powerhouse when it comes to marketing. We know this because that's where peoples attention is and they're visiting these social platforms multiple times throughout the day each and every day. I have a specialized background in online digital marketing and learnt from THE best in the industry. I then apply these skills into advertising not only myself, but Your home as well. 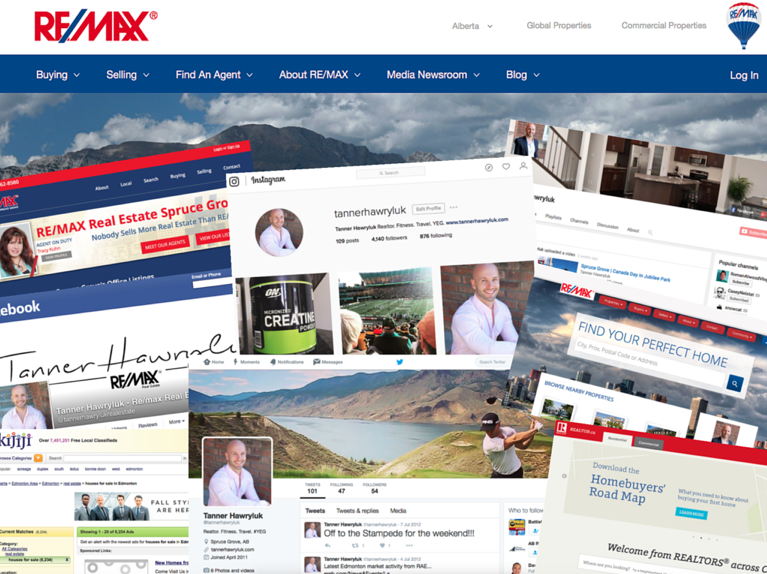 Not only are we marketing on Facebook through my personal Real Estate Fanpage and with Real Agent Connect...but we're also advertising on Google through banner ads, Instagram through my personal account where I have over 4,000 followers, through Instagram stories, Twitter and a plethora of other websites and social platforms to make sure that Your home is getting the most exposure possible. ...some of the websites and social media pages where Your home will be featured. 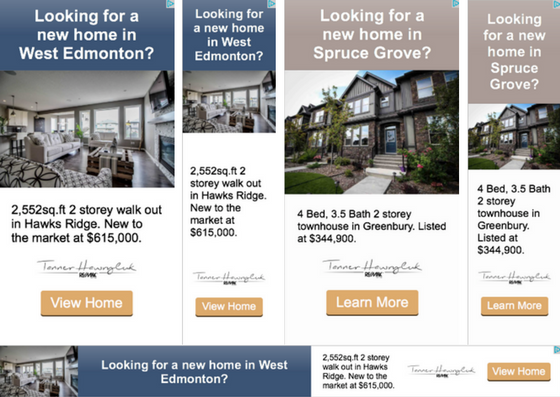 ...some of the banner ads that will be shown on millions of sites across the internet to people already actively looking at real estate online in a radius around Your property. Now that we're attracting the most qualified buyers to Your home, we want to create the best experience for them to envision themselves living in Your home. One of the easiest ways to do this is for me to help You stage Your home. But don't worry...that doesn't mean You have to go out and spend money on new furniture! I go through Your home with You room by room and make suggestions on how You can make that room shine. Sometimes we need a complete overhaul and other times we just need a couple little tweaks to make it show its best. At the end of the day I make suggestions based on Your budget and the time You want to spend prepping Your home for the market and then You choose whether to go with them or to keep Your home as is. One of the things that I like to provide is great quality highlight sheets or booklets for Your home. For example, if a buyer is going out and looking at 5-10 homes that day, and we're the only one with high quality info sheets or booklets...chances are they're going to take our sheet home and take a second look at it vs a home that has poor quality highlight sheets or none at all. There are different kinds of open houses and not all of them make sense for every home. Once Your property is listed and usually within the first week of it being on the market I host something called a realtor open house. Now it doesn't make sense for every home based off of location, community and what type of home You have, but if it makes sense, we'll do it! The purpose of this is to get the local realtors excited about Your home and hopefully jog their memory of buyers they're already working with that could be interested. This open house is usually hosted during the week and in the morning for about 1.5 hours. I provide some light snacks and refreshments in hopes to attract more realtors to Your home and once they're in it, the goal is for them to stay a bit, socialize and to really experience Your home. The second most common type of open house is called a public open house and is usually held for a couple hours on a weekend. Not all sellers want me to host one so we discuss the pro's and con's of a public open houses when I list Your home and if it makes sense for You. If we do decide to host open houses I once again create video ads inviting people to Your home. Whats powerful about this, is that I market this video ad to only the people who have shown interest in Your home from before. So that means that only highly targeted people who have clicked on Your homes ads from before, or have watched videos about Your home are going to see this ad. You can take a look at my open house video by clicking here. 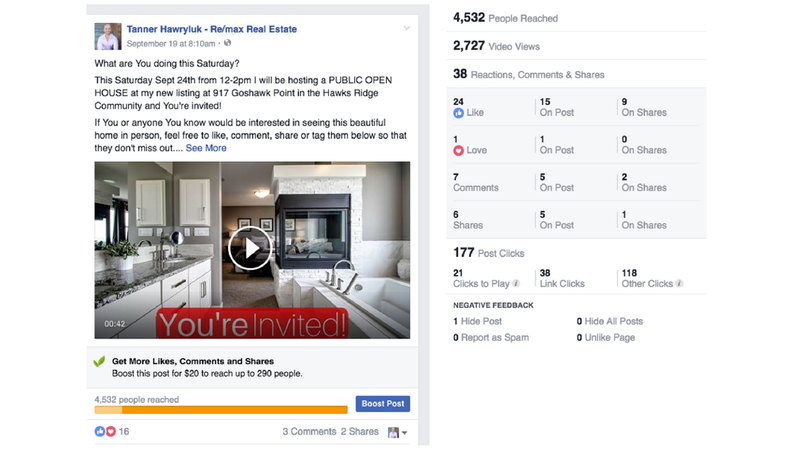 ...as You can see from the results of this ad it reached over 4,000 people and had almost 3,000 video views personally inviting them to this homes open house. What's important about this, is that this ad was seen only to people who have shown interest in this home before therefore giving them another exposure to it and yet another opportunity for us to keep it at the top of their mind. Not only that, but the more they see my face, the more comfortable they feel in reaching out to me or recommending me or Your home to their friends. 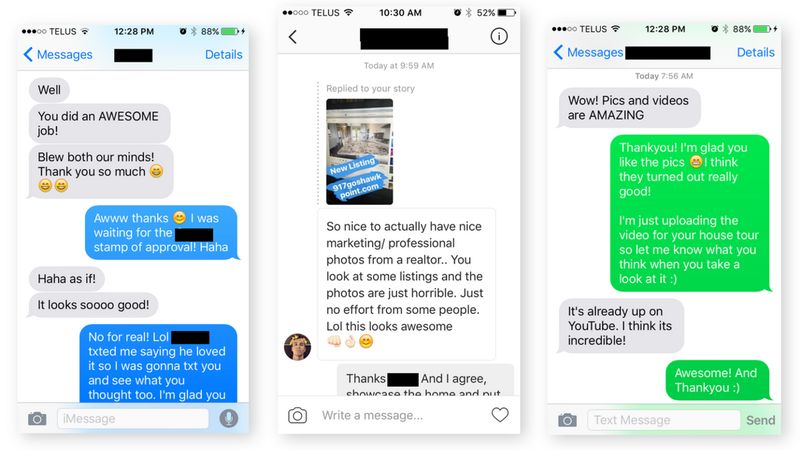 I also create Youtube ads that play before the main content and personally invite them to book a private showing of Your home. At the end of the day I do my best to create the ultimate BIG Brand Custom Marketing package for You and Your home and give it my all to get Your home the most targeted exposure I can with all the tools I have at my fingertips resulting in Your home being sold faster and for the best price. 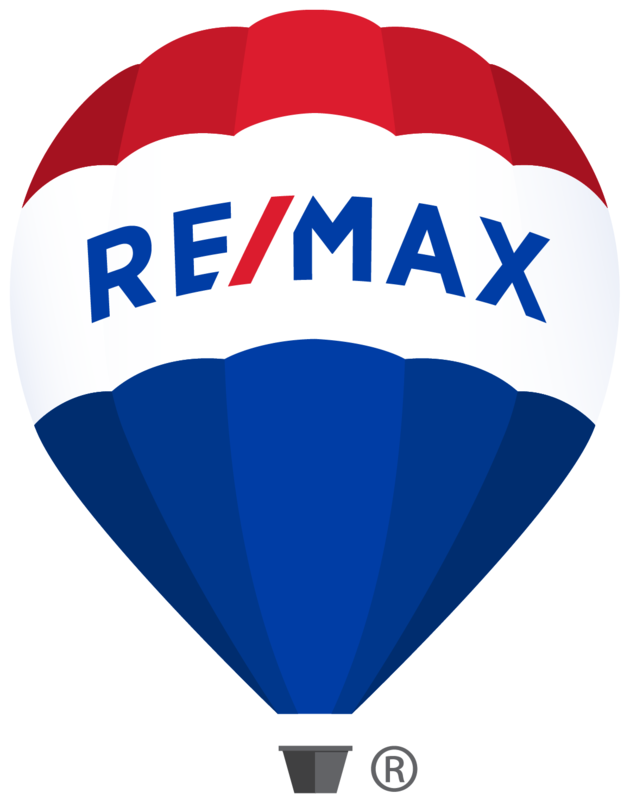 If You want to see how I can help You sell Your home, the next step is to get in contact with me either through a call, text or email and let me complete an accurate complimentary home evaluation at no cost. From there I will compile the most comparable homes that have sold and we will go through them together so that we're all on the same page. But more importantly it's crucial to me that You understand what the market is doing, how I arrived at the list price for Your home and then we come up with the perfect game plan for Your home to sell it for the best price, in the shortest amount of time. You can get in touch with me by filling out the form below.